In an evolutionary sense, there are many organisms in our reef tanks that stem from very old lineages of animal life. 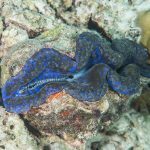 Sponges and corals have been around for several hundred million years, and, in that time, these groups have undergone a good deal of evolutionary turnover while still sticking to a familiar morphology. We could, in a sense, consider these “living fossils”, though, given their present day abundance and diversity, it’s probably best to consider these as unusually successful primitive organisms. However, there are some groups which clearly had their heydey long ago and which more accurately connote the meaning behind the term “living fossil”. 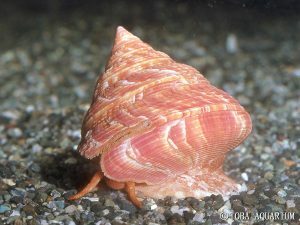 One of these—the Slit-shell Snail Perotrochus quoyanus—has just been brought up from the briny deep by the Curasub and been made available to the aquarium trade. 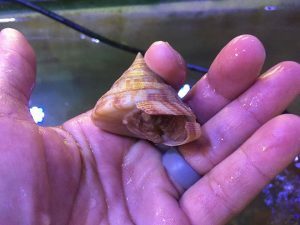 At first glance, slit shells don’t strike one as being anything all that special, as they looks almost identical to the common aquarium snails Astrea and Trochus. In fact, these groups are somewhat closely related, though just how closely is widely debated. The big picture of snail evolution is still poorly settled and a highly controversial topic among malacologists, but it seems increasingly evident that the group to which the slit shells belong—the Superfamily Pleurotomarioidea—represents a truly isolated and ancient branch in the snail tree of life. Of the 1,500 or so species currently described, only 25 are extant, but there is a rich fossil record dating back as far as the late Cambrian, 500 million years ago. Throughout the Palaeozoic and much of the Mesozoic, these snails were a dominant part of shallow-water marine ecosystems, but, with the appearance of more “advanced” groups, much of this biodiversity disappeared over time. Today, the slit shells are represented by just a handful of genera restricted exclusively to deep, rocky habitats below 100 meters. 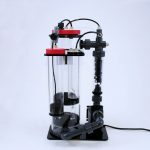 Given the difficulties of collecting samples, they were only discovered by scientists in the mid-nineteenth century (though the Japanese had stumbled upon them a century earlier). Up until recently, museum specimens were exceedingly rare; for instance, when the group was reviewed in 1965 by Bayer, only 13 specimens total were in the massive zoological collection at the Smithsonian. Since then, ROV’s and manned submersibles (like the Curasub) have greatly increased our knowledge and vastly expanded the availability of specimens. Shell collectors can now find some of the more common species for sale online for under $100. So what makes these snails so unique, aside from their antiquity? 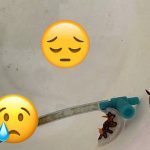 If you crack a snail open (proverbially, speaking), most species will have portions of their internal anatomy that are asymmetrical, lacking certain organs—gills, kidneys, hypobranchial glands—on the right side of their body. 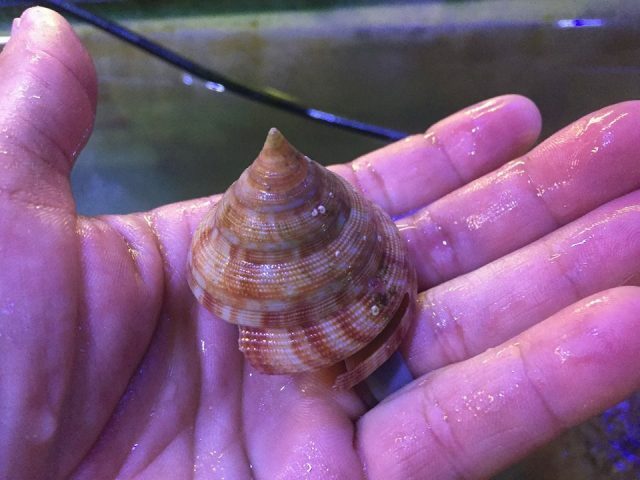 This is presumably an adaptation for living within their coiled shells, but, fossils indicate that the earliest gastropods would have been bilaterally symmetrical in the same manner that a fish or a reef aquarist is. 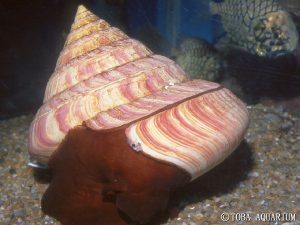 Slit shells are unusual in that they retain pairs of these structures on either side of the body, indicating a retention of the ancestral bilateral symmetry, while, at the same time, they also possess the asymmetrically coiled shell common to most modern snails. This combination of symmetry and asymmetry is something of an awkward compromise, and we see this manifested in the unusual slit that gives these creatures their common name. This thin linear opening present in the last whorl of their shell is used to discharge the water that is passed through their proportionally large mantle cavity and across the paired gills. Abalone are another group which possess a similar structure, though it’s not clear if these are truly homologous or if they were instead independently evolved. The aquarium specimen shared by Dynasty Marine appears to be Perotrochus quoyanus, a relatively common pleurotomariid in the mesophotic reefs of the Caribbean. 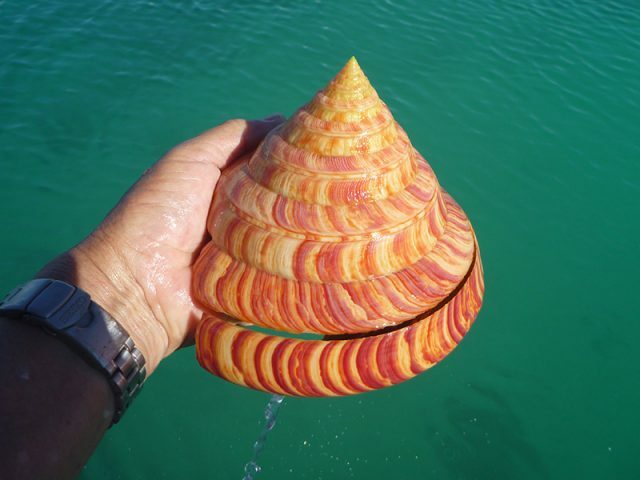 This species is one of the smaller members of this group, maxing out at around two inches in diameter, but other slit shells can reach an impressive girth, such as Entemnotrochus adansonianus, which maxes out at six inches!. Both have been collected by the Curasub, and, as discussed by Barry Brown, there appears to be a difference in their relative abundance and bathymetry. The rarer of the two is said to be E. adansonianus, which occurs more shallowly at 375-600 feet, while P. quoyanus is seen at depths of 600-800 feet and appears to be the more numerous of the two. They can be told apart most definitively by the relative length of their slits, which, in P. quoyanus, is far shorter. 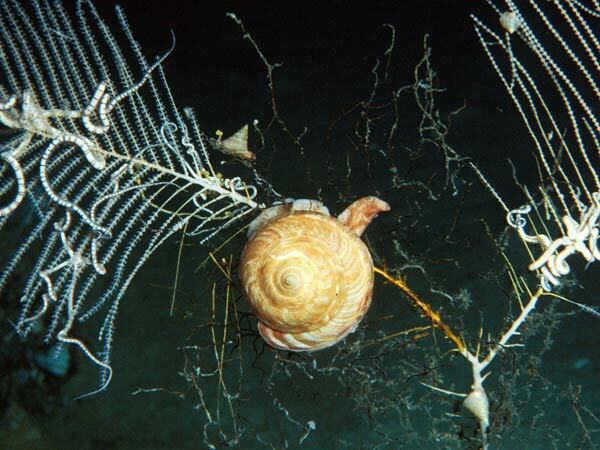 Wild specimens are most often found associated with sponges, which seem to form the bulk of their natural diet. The radular teeth that normally serve to rasp algae in the common marine aquarium snails are highly modified in this group, formed of many fine bristle-like structures which are thought to be an adaptation to their spongivorous lifestyle. 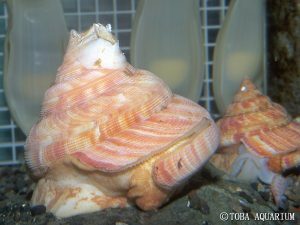 However, slit shells are not strict dietary specialists and have been seen preying upon various soft corals (e.g. gorgonians). Aquarium specimens have been kept previously by the Toba Aquarium in Japan, and it is reported that captive individuals will readily take meaty foods like clams and fish. 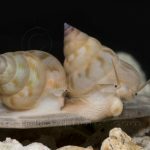 This is welcome news for any aquarists looking to keep one of these in their own aquarium, though, given their broad benthic omnivory, it’s likely a poor idea keeping a slit shell in a reef tank. And, since these originate from well below the thermocline, cooler temperatures are likely necessary. 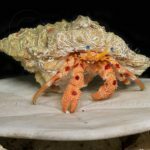 But, if these requirements can be met (most likely with a mesophotic fish-only biotope), this “living fossil” can make for an extraordinary addition, sure to wow all your invertebrate zoologist friends.